SSL certificates don’t range from ‘insecure’ to ‘secure’, but they do differ in the level of confidence they inspire in online visitors. 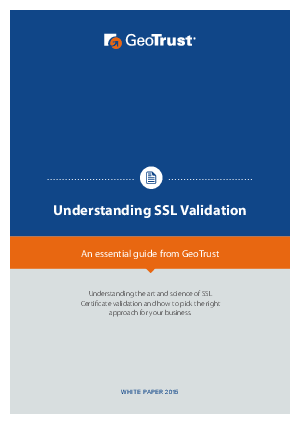 This whitepaper helps you choose the level of validation that works for you. With web-based attacks up by 23 percent in 2013 and phishing scams becoming ever more sophisticated, trust is in short supply online. E-commerce businesses dealing with customers’ sensitive data, in particular, need to step up to the plate and provide the right assurances to customers if they want to see increased conversion rates and fewer abandoned carts. But this isn’t just a problem for e-commerce. Almost every website involves some exchange of information, whether it’s login details for an online application or contact details on a landing page, and visitors want to know that their information is secure. So deploying an SSL certificate from a trustworthy certificate authority (CA) like GeoTrust is a must for any site owner. But what sort of SSL certificate works best for you? How can you tell your common-or-garden domain validation from your extended validation?